To Love The Way They Look. Clear Vision. Healthy Eyes. Latest Styles. High Fashion. High Tech. Down-to-Earth. We're located at 192nd and Q Street (near Tanner's and SpringHill Dental). 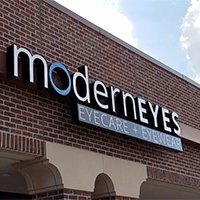 We are super excited to serve the West Omaha, Millard, Elkhorn and Gretna communities with high quality eyecare and eyewear for the whole family! Our services include comprehensive eye examinations and a wide selection of eyeglasses, sunglasses, and contact lenses. We will accept valid outside prescriptions as well, so feel free to stop in and check out our selection! Eye health is our utmost priority. We use the latest technology and equipment expertly handled by our Doctor of Optometry (i.e. "Eye Doctor"), Dr. Kristin Reed, to not only provide the right prescription, but also to screen for both eye and systemic diseases. Hate the "Eye Puff Test?" You're not alone! That's why we have an Icare Tonometer, providing us the same information, but with a lot less stress and "jumping!" We are committed to providing a wide variety of glasses frames, including many unique selections that you will not find at every other optical. Our goal is for you to look great and see better! We carry some frames from brands you may be familiar with (like Kate Spade, Calvin Klein, and Nike), along with some that you cannot find at every other Optical (141 Eyewear, Koali, Öga, and IC! Berlin). Feel free to stop in and browse our unique collection, there will be no pressure to buy anything, we would just love the opportunity to introduce ourselves to you. However, you might just find something you fall in love with! Dr. Reed is great at explaining things related to your eye health, using words that won't make your head spin. Dr. Reed is fully credentialed to take care of your eye health needs, including most of the more difficult cases. She is especially passionate about getting you the clearest vision possible. Some optometrists rush through "normal" eye exams because they are more interested the "medical cool factor." Dr. Reed is different, she loves making sure you get a prescription that is perfect for you!